Remove the mushroom stemp and marinade the mushrooms. Cut the top of your tomatoes and take the pulp out. Marinate the tomatoes with the caps. 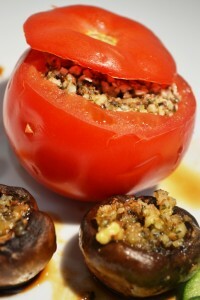 Put mushrooms and tomatoes in a baking dish, fill them up with filling mixture. Pour some of your marinade over top of you mushrooms and tomatoes and dehydrate for about 2 hours at 46 degrees or lower. I tend to cut the tomatoes in 3/4 and mushrooms in half for kids to enjoy 🙂 Pour the rest of the marinade over your dish.